Keep in mind that these strategy quotations were not taken from movies like “Dumb and Dumber” or “Tommy Boy,” but are from real leaders at real companies, half of which are from the Fortune 500. We don’t list these simply for amusement, although the last one still cracks me up. Make no mistake–bad strategy can literally kill a company. In a 25-year study of 750 bankruptcies, the researchers found that the number one cause of bankruptcy was bad strategy. Another study showed that strategic blunders are at the root of poor performance 81 percent of the time, making them the number-one cause of lost shareholder value. And anyone who has worked for a manager that didn’t have sound strategies knows all too well it’s one of the most frustrating experiences you can have. It’s convenient to blame the CEO for bad strategy. But, in my experience, it’s not usually bad strategy at the C-Suite level that’s the killer. It’s bad strategy at the VP and director level that really hurts a company. The directors and vice presidents are at the critical point where they can filter opportunities and threats before they get to the C-Suite. They are also in position to make the day-to-day resource allocation decisions that have the greatest impact on the marketing, sales and R&D teams. I know of one example where a vice president’s lack of understanding of the value chain entering a new market and the decision to outsource a key activity cost the company $1 billion in sales. Perhaps the biggest drain of poor strategy at the vice president level is the fact that the sales force then has to work dramatically harder to overcome these bad decisions in the field. For the sales team, this results in thousands of hours of lost time and reduced credibility with the customer. Not only do they have to work against the competition, but they are often put in the position of having to deal with unhappy customers because of poor decisions that their own company made! It also unnecessarily forces the field sales managers to work on boosting the decreasing morale of their sales reps.
1. Stop mixing words. 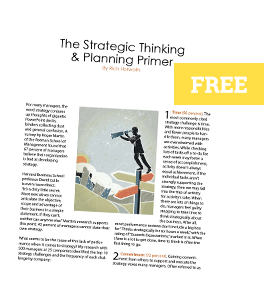 Since strategy is an abstract term, it’s challenging enough to define it without combining it with other words to make it that much more confusing. In reviewing hundreds of strategic plans a year, I often see terms such as “Strategic goals” and “Strategic objectives” used. Why? Goals and objectives are different than strategies, so cramming them together into one term only serves to muddy the water. To refresh, the goal is generally what you are trying to achieve (e.g., Increase sales). The objective is specifically what you are trying to achieve (e.g., Increase sales by 15% in the east region by Q3, 2016). The strategy is how generally you will achieve the goal/objective (e.g., Develop a real-time service model to support top-tier product users). Keep your plan simple by using the word, and only the word, that you mean. 2. Stop making things up. I’m all for creativity, so if you’re currently reading this in a brainstorming session, by all means, create. However, when it comes to setting strategic direction, creating new terms is inefficient and potentially harmful. If I were to ask your group to define the terms goal, objective, strategy, tactic, mission, vision, or values, there’s a good chance that you’d have similar answers because these terms all have concrete definitions. But if I asked your group to define terms like “Guiding Principles,” or “Business Drivers,” I’d be willing to wager that the answers would be all over the board. Why? Because these are not foundational business planning terms. And because they are not foundational concepts, they can be interpreted in lots of different ways, which can lead to miscommunication, misunderstanding and misdirection. When planning, use real words, not made-up ones. Note: Please feel free to email me with nominations for the 2nd Annual Strategy Fools’ Day selections. It’s never too early to set a bad strategy free.